"Daddy, 'I..O' spells 'let's go.' That is very short. It is just two words. Actually, it is just two letters. I and O." I gave my daughter the same response that people seem to give me when something random is just tossed out there. Namely, the non-commital, "Huh." 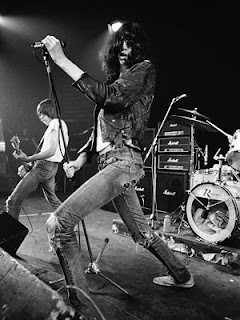 It then suddenly dawned on me what was playing softly on the radio - Joey Ramone was in the middle of the chorus for Blitzkrieg Bop and was chanting, "Hey! Ho! Let's go!" That's when it really struck me how impossible it is for us to control what our children pick up. Sure, KROQ is not necessarily the best pick as a 4-year-old worthy radio station, but I tend to balk at the idea that a child's world should be bubble-wrapped with only kid-friendly stuff. I like that kids pick up what they need and ignore what they don't. I also would point out that there is still some parental steering involved. In the radio station example, I might turn up the Owl City song and help them understand the lyrics on the very sensible idea that kids might enjoy singing about Fireflies. I will turn down NIN almost everytime, as I am not overly excited to teach my kids about animal fornication, especially not the way that Trent Reznor wants to teach it. But it has to be acknowledged that our children have way more teachers than we like to admit. I think the way to handle this situation is to surround yourself with as many people that you respect and trust and help to emphasize and bolter those relationships as your child's ad hoc educators. It is a very traditional thing to buy a Christmas gift for your child's teachers. I guess this new way of conceptualizing who counts as a teacher means that the gift list just exploded. Joey, I have a $5 Starbucks gift card with your name on it. The hard part will be to get it to you. As for the rest of you, hang tight. I'll try to figure something out. Just a quick update - my Google Adwords account has been disabled. Not that I was blogging for the money (OK, maybe I spun a quick fantasy here or there), but I just realized that one of the cool things about the Ads were how much they synched in with my posts. I post about Peeps? Blam! Ads about Peeps. Post about Bacon Salt? Blam! Ads about Baconnaise! I post about eating dolphins? OK, well no one really has ads about eating dolphins, so Google can't really be held accountable for that. So, I will try to re-enable the Adwords (I have to submit an online appeal), but I have to caution everyone to not click on all the ads (and especially not repeatedly). Click on a few, by all means, if you are curious. Definitely click on them if you need to buy yourself a plush Peep pillow or another 6-pack of Bacon Salt. But just don't make a habit of clicking for clicking's sake. Plus, although I am a bit disheartened to have to go through an online appeal process (and they ask a lot of question), I must give props to Google and their algorithms. I had a vague feeling that some people might be throwing in a bunch of extra clicks, but it wasn't like there were dorm rooms set up in China doing nothing but clicking on my blog. Still, they caught the hinkiness. So, faithful readers, no hinkiness. At least not with the ads, OK? It has been brought to my attention that I am rapidly approaching my one-month post limit, and I acknowledge that I have been lacking.